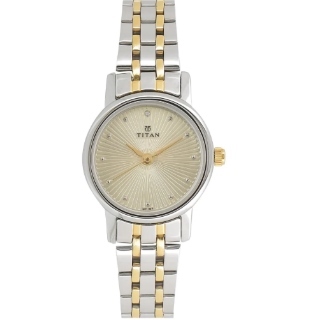 Titan Online Store Sale - Purchase Titan Karishma Champagne Dial Analog Watch for Women at Rs.1745. this watch from the Titan Karishma collection a must-have accessory for a woman. The de-plated circular design has joined hands with a Swarovski crystal on the 12-hour mark to create magic on the Champagne colour dial of this watch. Enhancing the distinct dial are the gold-coloured hour and seconds hands. Also get free shipping in India. All products on Titan store are original and go through strict quality check. Shop now!